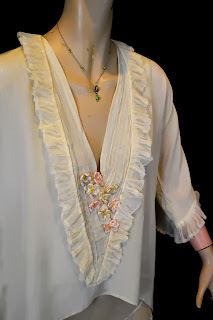 We are pleased to offer this fabulous tunic circa 1917-1920 inspired by designer Paul Poiret. FABRIC: The lovely tunic is fashioned from a semi-sheer, soft and wispy silk crepe in a shade of very pale melon green. 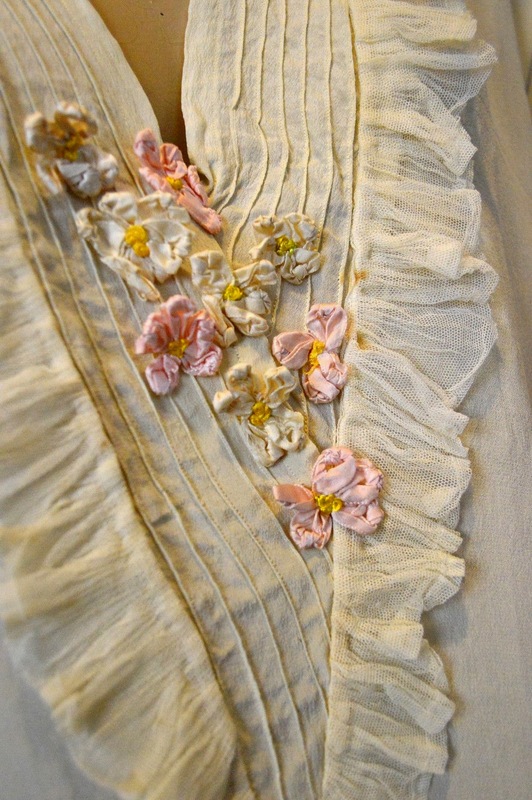 The entire tunic is hand done with intricate details. The top features a flowing silhouette with a deep "V" neckline and 3/4 length caftan/kimono sleeves both decorated with pleated ivory tulle. 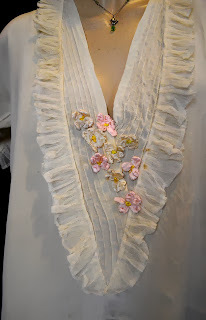 The neckline is decorated with a pin-tuck yoke adorned with lovely silk ribbon roses. Each "bow" of the rosette is twisted/knotted in the middle and decorated with yellow floss in the center. 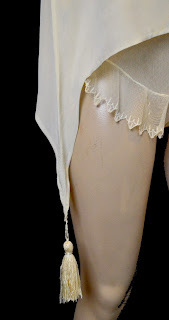 The tunic has long sides with matching ivory hanging tassels. 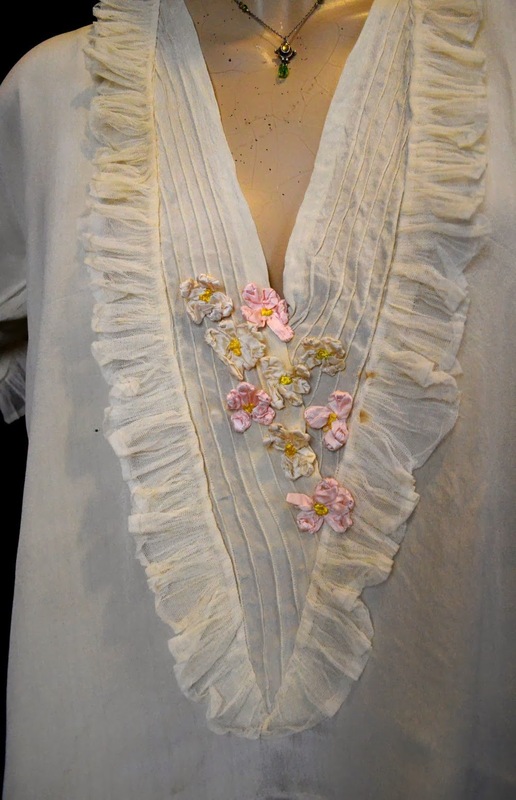 This was perhaps made for the boudoir but it is nice enough to be worn as a blouse. If you are unsure about the color of an item or the type of fabric, please do not hesitate to contact us. Want to know more about us? 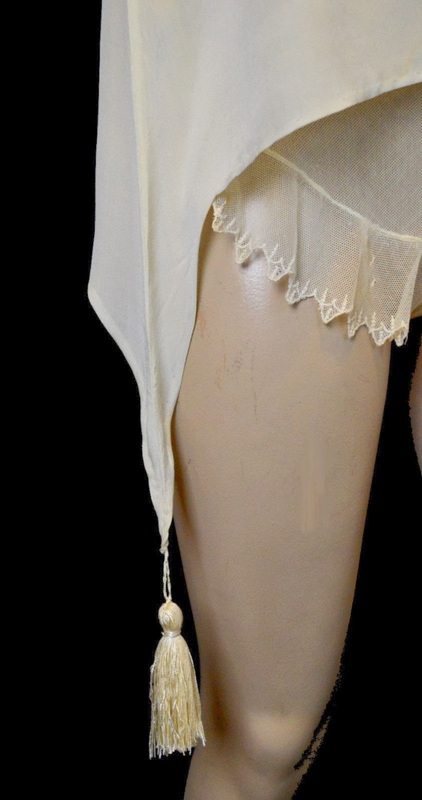 See our "http://members.ebay.com/ws/eBayISAPI.dll?ViewUserPage&userid=labellevintage_inc" page. Front length from shoulder to hem is 26" and the side length is 36"
We do not accept returns for measurements so please be sure to measure similar garment that fits you well and compare these measurements with those. Don't have a measuring tape handy? Please see our "http://members.ebay.com/ws/eBayISAPI.dll?ViewUserPage&userid=labellevintage_inc" page for a condition chart. The condition of each item is based on the chart that we have provided. 1) This has a slight shadow under the arms which will not be noticeable when worn. Not a Poiret. More likely inspired by Boue Soeurs if not one their creations. And yes, it is a pajama top.